If you have a domestic services business – such as cleaning, gardening, laundry services or window cleaning – a great way to attract new customers is via social media. You will most likely want to connect with customers in your local area and so you need to use channels that make it easy for people nearby to find your business. 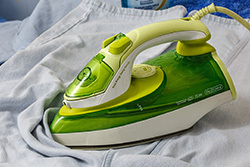 As there is a high level of trust often needed for customers hiring a domestic services business, for example, lots of people let their cleaners come into their home whilst they are out, it’s a good idea to choose social media channels that allow others to leave reviews and testimonials. Seeing positive feedback will allow a potential customer to have confidence that they can trust you. Google Plus – When searching for a service in their area a customer will often head straight to Google and type in “Cleaner Winchester” or perhaps “Gardener Northampton”, if you have a well-optimised website then there is a chance you may come up in the top results but you can increase your visibility by creating a Google Plus profile. There are lots of fields to fill in, including your location (which is the most important). Google then uses this profile to include you in the Local Listings when a user searches for a service. Try a search for “Window Cleaner Bournemouth” – you’ll see in the results that there is a map and a list of local businesses that offer a window cleaning service. 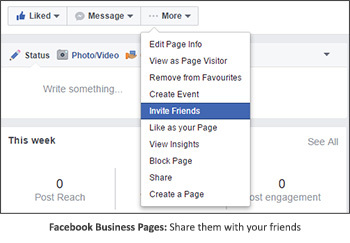 Facebook – This is an excellent place to have a business page as you can then use your own Facebook profile to share your page with family and friends in your local area by using the ‘Invite Friends’ facility (see image to the right). The goal is to get everyone you know in your local area to then share your page so even more people nearby can see you have a business. It’s a great way to leverage your local network of connections. You can also create Facebook ads for your business page that target potential customers that live in a certain area. LinkedIn – If you also undertake commercial services (such as office cleaning, ground maintenance etc) then it would be a good idea to set up a LinkedIn profile and business page. LinkedIn is excellent for business-to-business (B2B) networking, make sure you connect with as many of the people you know as possible. Also, if you go to any networking events then make sure you add people you meet at them. Yell.com – Yell is such a widely-known business directory (and its individual listings are indexed well by search engines) so you should make sure you have your business listed on there. You should also encourage customers to leave reviews for you so that your listing stands out with a star rating – this also shows in Google search results. Checkatrade.com – There is a postcode search and a reviews and ratings system, so customers can see you are nearby and if you are good at what you do. Don’t forget to encourage your customers to leave you a review. Don’t worry that you haven’t got any reviews to start with, ask some of your current or previous clients if they would put one on there for you, I’m sure they will be happy to. Your social media profiles are your first point of contact for many customers, so they really need to sell your business. They should contain plenty of information – but make sure it’s straight to the point and not too wordy. Include as much relevant information as possible, especially details like opening hours (or times at which you’ll answer the phone), types of client (e.g. if you only do domestic cleaning make sure this is clear, so that you don’t get people contacting you about commercial jobs), any qualifications or experience you have etc. You should also make it clear to a potential client how you can help them, e.g. why will your gardening services be good for them? “Our weekly gardening service allows you to enjoy a beautiful garden all summer without having to spend your free time weeding and mowing” – I know that would entice me! Images of you and your team (if you have one). Domestic services is often a very personal type of business, as you’re coming into a customer’s garden or home, so it’s always nice to show pictures of who you are. This will make the customer feel more at ease that you are a real person and they can put a face to a name before they meet you. Don’t forget to smile! Any events you (or your team) are involved in, if someone in the team is having their head shaved for charity then post about it, you could video it too! Your social media and directory profiles will build up over time, so just keep adding to them when you can. You don’t have to post every day but I recommend at least twice a week as you want to make sure there is current activity keeping you at the forefront of potential customers’ minds. Don’t forget to ask all of your current customers for reviews and then set up a procedure so that you ask new customers as well. For one-off jobs a good time to ask is when you send the invoice (as you can include a link to the review site if you email the invoice), or for regular customers perhaps ask for a review after the 5th visit. As your profiles build up they will become excellent sales tools, your business will be easier to find by potential clients and a full, active profile will encourage them to contact you. Good luck! Feel free to comment below with any additional ideas you have to add to my suggestions above.